After two weeks in the 70s, it's back to this 60s with this issue celebrating the upcoming inauguration of John F. Kennedy as President. *Of course, if' you'd like to help me rectify this by expanding my TV Guide collection, I'll be more than happy to accept your donations. Email me and I'll give you my Paypal account. Perry Como has no complaints about being labeled a nice guy. "I suppose it is a tag it's hard to swallow at times. Mr. Nice Guy. But what in hell is wrong with that? I don't know anyone in his right mind who doesn't like to be thought of as a nice person. *"
*Dennis Rodman doesn't count; we're talking about people in their right minds, remember? Como is the 50s version of the king of cool, with one wife, three children, two homes, two cars and two offices, all of which are an oasis of calm. As of 1961, Como has been on television longer than any other singer, and NBC pays him $1,250,000 per year for his services. (He has an additional two-year, $25 million contract with Kraft Foods, sponsor of his show.) And his biggest problem, according to industry insiders, is that Perry Como is bland. As one says, "Perry's got all the seven sins - green, envy and so on - but he's blocked them out - almost." When asked to explain the "almost," the source replies, "Well, he gets just as angry as anybody else if the men's room is locked." Como's lifestyle would probably be considered unacceptable today, lacking the spicy elements of "celebrity" that seem to be prerequisites for stardom. He's heard it all, of course, but "It really doesn't make a hell of a lo of difference to me." But, he adds, ""I've got my moments, like everyone else. But I hide 'em better'n anyone else*. That's all it is." When arguments do arise during production, "It takes me just 10 seconds to tell 'em - to set things straight. And then maybe they think, 'Maybe this old so-and-so, he's been around, maybe he's right.' I haven't beat anyone up lately. Nobody's beat me up. Maybe they have respect for my old age. Here's a guy - me - sings a song, goes home, takes a bath, grabs what few dollars he can - of course, I'm exaggerating; it's a damned sight more than a few dollars - and doesn't beat up the old lady. She could probably beat me up. What do they expect me to do?" *Obviously, the man is immune to Freudian theories of repression. Is it just me, or is this kind of refreshing? It didn't hurt Como's career; his regular series runs until 1967, and his Christmas specials run for years after that. Perhaps it's because Como was a barber before his musical success, and could probably go back to cutting hair if he wanted. There's no sense of entitlement from Mr. C, though - "I've had things so good, I've just never really had to worry. It's a hell of a feeling. If that's bland, then I'm bland. And pretty damned glad of it, at that." I covered a previous Como cover story here. At the time, Como shared the spotlight with an article written by a young U.S. Senator from Massachusetts, John F. Kennedy, who wrote of television as a "force that has changed the political landscape." This week Kennedy again is front and center, as JFK prepares to be sworn in as President of the United States. Television provides complete coverage of Friday's festivities, which I wrote about in a "Retro TV Friday" at the motherblog some time ago. Rather than repeat it, I'll just steer you in that direction. Speaking of politics, however: last week I mentioned how TV Guide wasn't afraid to take a political stance, whether defending the CIA against its critics or taking the media to task for trying to scare the public with "biased" science. That wasn't something new for TVG, though, as we see in an article this week by Dr. Frank Stanton, president of CBS, discussing the impact of the "Great Debates" of 1960 and urging the public to write to Congress so these debates might continue in future presidential campaigns. The only reason the debates were able to happen in 1960 is that Congress temporarily suspended the equal-time requirement, allowing the networks to cover the Kennedy-Nixon debates without fear of demands for equal time from other candidates. Nearly 90% of television households watched the debates, which played such a pivotal role in the outcome of the election. However, unless the equal-time law is repealed, future debates could be in jeopardy. Writes Stanton, "the equal-time law is not needed to assure fairness to the candidates and [its] repeal is needed to assure fairness to the American people." Television, Stanton argues, like other American institutions, has its part to play in the events that determine the country's future. "Let's use television wisely, fully, effectively in the most serious business that a democracy has - choosing its leadership." All well and good, bu in retrospect, some of Stanton's concerns do seem a little naive. For instance, in the absence of debates, Stanton sees "the pattern of set speeches, fake interviews and stage-directed rallies, all on paid time, that constituted the use of television in campaigns before 1960" - and, I would suggest, are principal elements of television's coverage of campaigns today. Nobody seriously looks at debates as anything other than joint media appearances by the candidates, most of whom mouth the same old platitudes as always. The political conventions themselves, which were quite lively in the 60s, are almost entirely media-driven public relations events, with not an ounce of spontaneity. And anyone who would suggest, as Stanton does, that television can help form a "more informed electorate" will probably take up my offer on a bridge for sale in Brooklyn. I don't ridicule Stanton, however; I suspect he would be at least as appalled by today's campaigns as anyone. And that's ultimately what's tragic about it, when one looks at the promise and potential that Stanton saw back in 1961. Interestingly enough, after JFK's assassination, ABC news chief (and former Eisenhower press secretary) Jim Hagerty voiced the concern that, should security concerns prevent future presidents the chance to move freely and mingle with the public, they might be reduced to reaching the votes solely through speeches on television and radio. I suspect that the major reason for reliance on the media is cost-effectiveness; after all, you can reach a lot more people through television for a lot less money per voter. Nonetheless, there can't be much doubt that security constraints play a role as well. It is a sad commentary that we now live in an age when someone has to take their lives in their hands to run for president, and have to have their interactions with the public regulated. Whatever the reason, the difference in coverage between 1960 and today is a substantial one indeed. Here's a show I literally haven't thought about for decades. On Saturday afternoons, frequently between a sports event and the local news, Channel 4, WCCO, would present a time-filler called Almanac Newsreel. It was usually only about 15 minutes long, and seldom topical in the sense that it was reporting on current events. I could be sitting in the living room in 1967, having watched a football or basketball game, and suddenly be confronted with footage of the sinking of the Andrea Doria or, as in this instance, the death of Pope Pius XII in 1958 (seen near the end of this collection). Watching these clips while writing this piece brought back some long-ago memories for me. I haven't seen Almanac Newsreel since I was a kid, so it's been over 40 years; and I hadn't even thought enough of it to look it up on YouTube until now. The show always carried something of a fascination for me; part of it was that there seemed to be no reason for it to be on, since there was almost always a total disconnect between events that had happened a decade or more ago, and I wasn't sure what I was supposed to make of it. It was also short; if I left the room to go to the bathroom or get something to drink, it would be over by the time I returned. There were probably times when I might not have even realized that one show had ended and the other started. But for a kid not yet 10, I'm sure that was all the linkage one needed to make. I don't remember when WCCO stopped running Almanac Newsreel, but I know it was on at least into the very late 60s - but it seemed as if it had been on forever. And, considering it had been shown though the entirety of my life to that point, it might as well have been forever. A couple of weeks ago, I wrote about Richard Boone's 1950s medical series Medic. This week Boone, now the star of Have Gun - Will Travel, namedrops the series himself. "Every time I had a heart case, I got all the murmers," the hypochondriac Boone says. "When I was performing an ear operation, my own hearing went sour. I won't discuss brain damage - some of my friends might say I had that long before Styner." 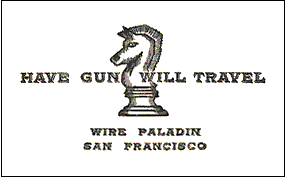 Boone's iconic role is that of Paladin, the gun for hire with the distinctive calling card in Have Gun, the show I most like that I wish I liked more than I do. Paladin is a rich character - suave, sophisticated, intelligent, a man at home at the opera, the theater, in intellectual discussions. But when he takes a job, he becomes the man in black, menacing, willing even to turn against the person who hired him if he finds out he's been lied to. Boone plays this complex character well, in a manner totally different from how Wayne or Eastwood might have seen the role. (Perhaps the Magnificent Seven-era Yul Brynner would have been up to the task.) However, my problem with the series is that Paladin rarely follows through with the menace as often as I'd like. Being an intelligent man, he seeks to avoid violence unless it's necessary, and I'll be frank that I'd like to see him avoid it a lot less often than he does*. Maybe I've been raised on the Eastwood model of how to handle a problem, but I can't help thinking that a little less sensitivity and a little more frontier justice would have been just fine. But then, Gene Roddenberry was one of the early writers for the show, which explains a lot. *A complaint I also had about the Edward Woodward series The Equalizer. Lest you think I'm being too harsh, I'll hasten to add that I purchased the first three seasons on DVD when those were the only three seasons available, and I'll be happy to add the final three somewhere along the line. Just because I want to like it more doesn't mean I don't still like it. Keeping in the spirit, the pro football season ends on Sunday with the NFL Pro Bowl from Los Angeles. All-star games were much bigger back in these days; fans in all sports didn't get to see many games other than those of their home team, and the all-star game was one of the few times the average viewer could see some of the biggest names in the game. This one had some pretty big ones, too; can you imagine a team where your two quarterbacks were Johnny Unitas and Bart Starr? One other sporting event, on Saturday night, a big one: the world middleweight boxing championship from Boston, featuring champion Paul Pender* taking on challenger Terry Downes. It's a hometown fight for Pender, who hails from nearby Brookline. I thought I might be able to find a YouTube clip of this, but no sale. However, I can tell you that Pender successfully defended his title with a 7th round TKO in the first of his three title fights against Downes. Downes would win the rematch six months later in London, but Pender would take the rubber match, and the title, in their third fight back in Boston in April of 1962. *One of the middleweight champions, that is. Pender, who'd defeated Sugar Ray Robinson after Robinson had been stripped of the National Boxing Association crown, shared the title with Gene Fullmer. JACKIE GLEASON - Panel(Debut) Jackie returns to television as host-moderator of a weekly half-hour panel show, "You're in the Picture." The panelists, four in number, put their heads through the four portholes in a large picture cut-out (like the ones used in old-time photography studios) and are then asked to identify the setting. Doesn't tell you much, does it? And yet it's innocuous tidbits like this that I live for. This post made me curious, so I applied a currency calculator to Perry Como's paycheck to see what its modern equivalent would be. You said his deal with Kraft was for $25 million, but I wonder if you meant 2.5 million. If so, it would be worth $19 million in today's dollars. ($25 million would have been something like $192 million, which is a lot of mayo and mac & cheese.) His NBC contract would be worth something like $9.6 mil in today's dollars. Neither number would be especially eye-popping for a TV star nowadays. Imagine, something that hasn't inflated beyond belief in 50 years. I suspect the $25 million was the show's total budget for two years, with Como earning $1.25 million a year ($2.5 million for two years), which was 10% of the show's total budget. 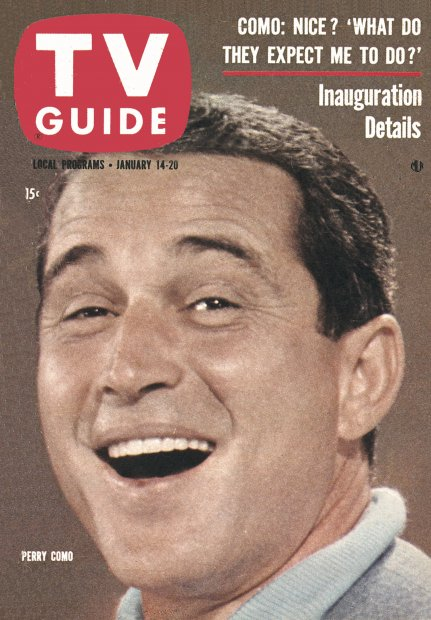 Also, I believe Perry Como's weekly series ended in 1963, but that he did ten to twelve specials annually (once per month) from 1965 through 1967. From 1963 to 1965, it replaced "Suspense Theatre", also sponsored by Kraft, once a month. Guess Perry sold lots of Velvetta and Mac 'N Cheese! Ed Hookstratten, Joe Buck, The Fugitive and more!